EPA UST Overfill Prevention Rule: The September 23, 1988 Environmental Protection Agency (EPA) 40CFR Parts 280 and 281 Technical Requirements for regulated Underground Storage Tanks (USTs) required equipment that is capable of preventing an UST overfill. Subpart B ‐ UST Systems: Design, Construction, Installation and Notification §280.20 (c) Spill and overfill prevention equipment, except where exempted, owners and operators must use overfill prevention equipment that will automatically shut off flow into the tank when the tank is no more than 95% full or alert the transfer operator when the tank is no more than 90 % full by restricting the flow into the tank or triggering a high level alarm. Later, the EPA revised the rule to permit restricting the flow into the tank at 95% of capacity in response to comments that excess top of the tank ullage was requiring more frequent deliveries and associated spill risks. EPA Must for USTs publication: In September 1988 EPA published a summary of the new regulations with compliance suggestions. 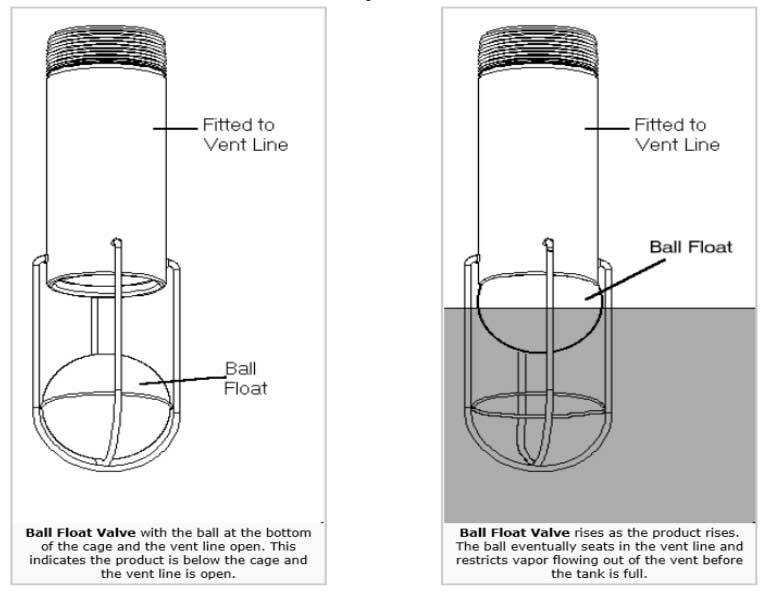 Page 16 addressed Spill/Overfill Prevention and listed three options for tank overfill prevention namely, (a) Automatic Shutoff Devices; (b) Overfill Alarms or (c) Ball Float Valves. The unintended consequence was to specifically identify Ball Float Valve equipment as an EPA approved “automatic shut off device” which unfortunately, has resulted in ball float valves being the most common overfill prevention device in use today. This paper describes why the Ball Float Valve usage is not the best available control technology (BACT) and is contributing to spills, overfills and tank ruptures. Electronic Automatic Tank Gauge (ATG): The ATG has evolved as a state‐of‐art electronic device that provides monitoring functions including fuel management, with low and high product alarms. ATG’s may be programmed to determine the 95% ullage level (i.e., amount of product that is required to make the tank 100% full) and to alarm when the product tank exceeds that 95% level. The alarm may consist of a warning light and/or an audible alarm at the ATG Console. The ATG Console is located in the equipment room of the refueling facility and the alarm does not “alert the transfer operator” who is located outside of the building. Thus, the audible alarm may be supplemented by an outdoor alarm loud enough to overcome traffic noise. However, the location of outdoor alarms is critical. The audible alarm must be located in the vicinity of the transfer operator, clearly visible from where the operator is likely to be standing and clearly labeled as an overfill protection device. Since the alarm does not slow down the flow of product to the UST, the transfer operator has only some 60 seconds to shut off the truck delivery valve to allow for the time it will take to drain the hose contents (14 gallons for a 20 foot 4 inch diameter hose) into the tank. As a result, installing an audible alarm near the transfer operator has not proven to be a practical option for public retail refueling facilities. Mechanical Ball Float Vent Valves: These are also known as float‐vent valves, they are fitted on the bottom of the vent line inside the tank. When the product level is below the cage, the ball rests at the bottom of the cage and the vent line is open (see attached Exhibit B for illustrations). As the level of the product rises above the bottom of the cage, the ball floats on the product and rises in the cage. As the delivery continues, the ball eventually seats in the vent line opening and restricts vapor flowing out the vent line before the tank is full. Flow restrictors must begin restricting flow when the tank is 95 percent full or 30 minutes before overfilling. If the tank top is tight, the ball float valve is intended to create enough back pressure to restrict product flow into the tank. When a ball float valve closes, the vapor in the tank ullage compresses gradually and acts as a cushion, thus there is little movement of the product delivery hose to signal the transfer operator that product has stopped flowing. However, if the UST has loose fittings or other non‐tight tank top components, flow will not be restricted and an overfill will occur. Mechanical Fill Pipe Shutoff Valve: The fill pipe prevention valve is integral to or may be retrofitted into the four inch drop tube used for submerged filling of USTs. When the tank liquid level rises to 95% of tank capacity, the valve closes automatically into the path of the product flow and reduces flow to approximately 5 gallons per minute through a bypass valve. The transfer operator may then stop the filling process and disconnect and drain the delivery hose. As long as the liquid exceeds the 95% level, the valve will close automatically each time a delivery is attempted. If the delivery attempts are not stopped, and the liquid rises to about 98% of tank capacity, the bypass valve closes completely (see Exhibit A for illustrations). No additional liquid can flow into the tank until the level drops below a reset point. The EPA web site as of 09/24/12 ( http://www.epa.gov/oust/ustsystm/balfloat.htm) provides a description of how ball float valves are designed to operate. The EPA illustrations, shown on attached Exhibit B, do not explain how the ball float valve continues to allow fuel to be added to the tank at a reduced rate. However, this is normally accomplished with a 1/16” or 1/8” diameter vent hole in the pipe above the closure point inside the tank. This vent hole in the pipe is designed to relieve the hydraulic pressure from the liquid above the tank and the air space in the ullage when flow into the tanks is reduced. Fuel rises until the ball float valve closes. Once closed, the tank ullage is compressed, the delivery flow into the tank is reduced gradually, the transfer operator does not see a “hose jump” from hydraulic shock and does not know that the float‐vent valve has closed. This requires the transfer operator to periodically feel the hose for fluid flow vibration and/or look at the sight glass to see bubbles in the product flow. The pressure will equal the fuel head pressure from the fuel level in the delivery truck to the ball float closure point. This pressure can be as high as 6.3 psig depending on the truck fuel level, the tank burial depth, the position of the ball float and cause a seepage spill from worn hose connection gaskets. At the point the ball float valve actuates, the transfer operator can close and then “crack open” the truck tank valve (permitting air in) to drain the hose into the tank. As the vapor slowly vents, the escaping vapor is replaced with fuel from the delivery truck. The pressure in the ullage is maintained since fuel flows into the tank at the same rate that the vapor escapes. But, the rate fuel being delivered is significantly lower than the delivery rate before the ball float valve closes and it may take up to 30 minutes for the ullage pressure to be relieved through the vent hole.Truck drivers are paid by the load and typically do not want to lose 30 minutes of productive time. Thus, an experienced transfer operator knows that propping open the drain mechanism on the spill containment manhole will increase the release of the tank ullage vapors to the atmosphere at ground level and risk the potential of vapor ignition and a fire. An automatic shutoff device installed in an underground storage tank (UST) fill pipe will slow down and then stop the flow of product to the tank when the product has reached a certain level in the tank. Federal regulations require that shutoff occurs when the tank is 95 percent full or before any fittings located on top of the tank are exposed to product. This device has the option of one or two valves that are operated by a float mechanism. The illustration in Exhibit B shows one type of automatic shutoff device. Note that the float is down and the fill valve is open. 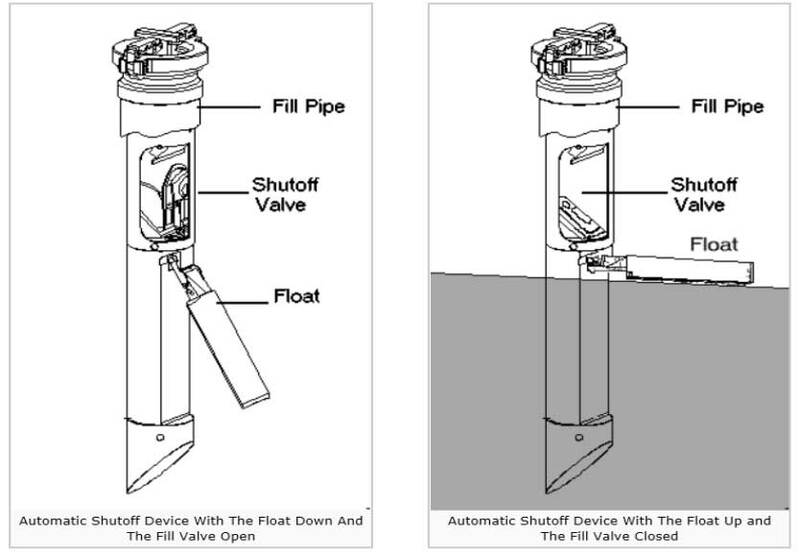 The illustration on the right side in Exhibit B shows the same shutoff device with the float up and the fill valve closed. Automatic shutoff devices should operate in two stages. The first stage drastically reduces the flow of product to alert the transfer operator that the UST is nearly full. The operator can then close the delivery valve and still have room in the UST for the product left in the delivery hose. If the transfer operator does not pay attention, and the liquid level rises higher, the valve closes completely and no additional liquid can be delivered into the UST, leaving the operator with a delivery hose full of product. The OPW 61S0 is a two‐stage shut‐off valve. When the liquid level rises to about 95% of tank capacity the valve mechanism is released, closing automatically with the flow. This reduces the flow rate to approximately 5 gpm through a bypass valve. The operator may then stop the filling process and disconnect and drain the delivery hose. As long as the liquid exceeds the 95% level, the valve will close automatically each time delivery is attempted. If the delivery is not stopped and the liquid rises to about 98% of tank capacity, the bypass valve closes completely, and no additional liquid can flow into the tank until the level drops below a reset point. It should also be noted that when the ball float valve closes, it shuts down the fuel flow rate. Depending on how quickly the valve closes, the momentum of the fuel into the tank causes a spike in the tank ullage pressure (in plumbing this is called water hammer). If the ullage is large enough, it acts as a pressure dampener and the spike in the ullage pressure is minimized. However, if the ullage is small, the spike can be significant. Some studies show pressures in excess of 50 psig. 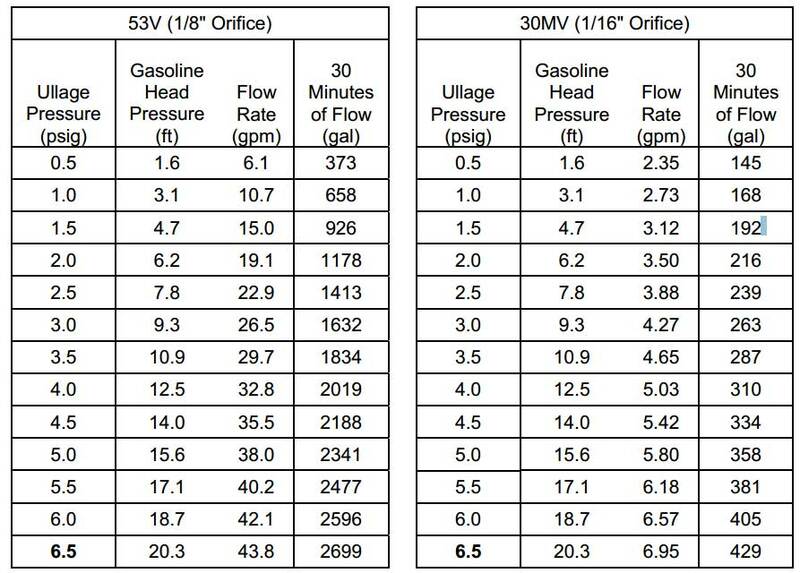 The Table of OPW Ball Float Valve Fuel Flow Rates at Various Head Pressures in Exhibit A shows what fuel flow rates to expect with the two OPW ball float valves closed at various head pressures. The Table includes the resulting 30 minute flow volume based on OPW data which includes the OPW recommended 73% pressurization factor and the OPW 1.5 safety factor. The Table shows that actuation of ball float valves repeatedly pressurize atmospheric UL Listed USTs at pressures up to 6.5 psig many of which are beyond the Underwriters Laboratory design strength and over time risks weakening tank or bulkhead seams and fitting penetrations that may lead to underground leakage. Ball float valve equipped tanks are vulnerable to rupture failures when deliveries are made with pump equipped tank trucks. It is a common practice to use tank trucks up to 5,000 gallon capacity range to make fuel deliveries in urban areas where street access is limited. These dual purpose trucks are typically equipped with positive‐displacement pumps for delivery into home and commercial fuel oil tanks. These pumps are capable of pumping at pressures of 50 to 125 psig and, when used to fill tanks with ball float valves, the pumps will rupture the tanks when the valves are actuated and close off the tank vent to atmosphere. Thus, there is no room for error (i.e., shut off flow and drain the hose as in a gravity delivery) and the transfer operator must ensure that the tank ullage will accommodate the delivered quantity or the tank will likely rupture. Unfortunately, there is documented history of such tank ruptures in areas such as Washington DC, NYC, Long Island, Philadelphia, California and likely elsewhere. An automatic shutoff device installed in an underground storage tank fill pipe will slow down and then stop the flow of product to the tank and then stop the flow of product to the tank when the product has reached a predetermined level. When the product flow is slowed down in a pressurized pump actuated delivery, the product will back up the fill pipe and result in a visible surface spill rather than a ruptured underground tank release. Certain implementing agencies have had adverse experience with ball float vent valves and either recommend against or prohibit the application of ball float valves as an overfill prevention device. Following is one agency that has recommended against the application of ball vent valves and another that has banned their use. If an installation plan shows a vent valve, encourage the owner to replace it with a fill tube valve. If the owner insists on use of vent valves, secondary containment and interstitial monitoring for all the riser pipes is required. At double wall facilities where both devices have already been installed, require removal of the vent valve if the pipe risers are not secondarily contained and monitored, share this information with the owner and recommend removal of the vent valve. At single walled facilities, pipe riser are regulated and require corrosion protection if a vent valve is used. To avoid the requirement to retrofit with corrosion protection, suggest the use of a fill tube valve instead of the vent valve. Share this information with tank owners, operators, and contractors in your jurisdiction. Since 1995 Long Island in Suffolk County, no longer allows float vent valves. Ball float vent valve actuation repeatedly pressurizes atmospheric USTs at internal pressures not intended for UL Listed atmospheric tanks, and over time risk weakening tank seams and fitting penetrations which may cause product or vapor releases. Since 1997 state and other UST Rule implementing jurisdictions followed EPA publications and as a result have experienced hydrocarbon vapor and liquid releases from ball float vent valves. Since 2003 the National Fire Protection Association recognized that ball float vent valves were a fire and safety risk and prohibited their use in new/replaced USTs. Uncontrolled hydrocarbon vapor releases occur every time a ball float vent valve is actuated in the USA. Significant underground releases have occurred from pressurized deliveries into USTs equipped with ball float vent valves. The November 18, 2012 EPA proposed UST Rule revisions, while agreeing “vent line flow restrictors are a significant concern for operability and safety,” will permit the continued operation of USTs with ball float vent valves with their associated fire safety and environmental risks. Note: The minimum ullage volumes are not provided in the OPW literature for each condition. Example flow rates are provided below. The gasoline head pressure is feet of gasoline head above the fuel level with the ball float valve closed.